Neext! is a film about Keira a Cricklewood local going through millennial life in her community. Cricklewood locals and businesses will be directly involved in the making of this romantic comedy. Neext! is made by an all-female crew and is set in the vibrant centre of Cricklewood. It isn't the typical ‘trendy’ London which we are used to seeing on film, yet it's exactly where many millennials live! This light hearted rom-com will show Cricklewood in a new light, while empowering women to be everything they want to be, not defined by looks, profession or their decisions. Neext! is centred around Keira, a Cricklewood resident. Being active in her local community is an important part of Keira's identity and to show that we will involve residents as crew members & extras in the film. Shooting locations are: The Crown, train station and market. A a free screening of Neext! will be organised with Ashford place at the Lexi.This will be followed by a Q&A and a workshop. Our aim is to fuel interest and inspire other creatives in the area to see their local environment as a source of inspiration.The money raised will go towards paying the screening, cast and crew, equipment & locations. Our local community and environment is our main source of inspiration for the film. 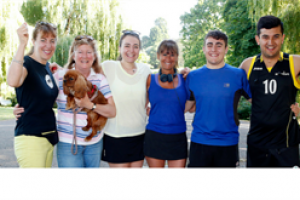 Being active members within Cricklewood as well as filmmakers, we realised that we wanted to do something that shows the daily life in this community. 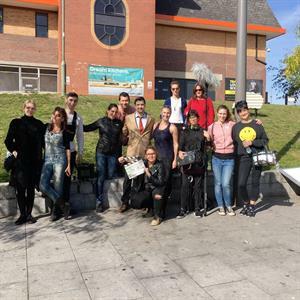 The film will shine a different light on our neighbourhood, will change people's perception of the area nationally and internationally and will spark interest in the arts with locals. Essentially, we want to inspire and educate other creatives and film makers to use their environment as a source of self-expression. We will be collaborating with Ashford place , a well known organisation in Cricklewood that is very active in working together to create community initiative. Finally the Lexi a local cinema run by volunteers is a perfect choice to hold the public screening Q&A and workshop. There are many brilliant romantic comedies but as a lot of them are seen through a male perspective, many of the female protagonists become quite stereotypical. This is why we want to create a film that will allow women to relate to the lead character. We are all so different yet we all recognise ourselves in Keira. 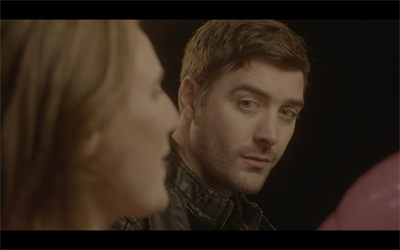 Our lead male actor is Irish and we chose him to represent the Irish heritage which Cricklewood is so famous for. 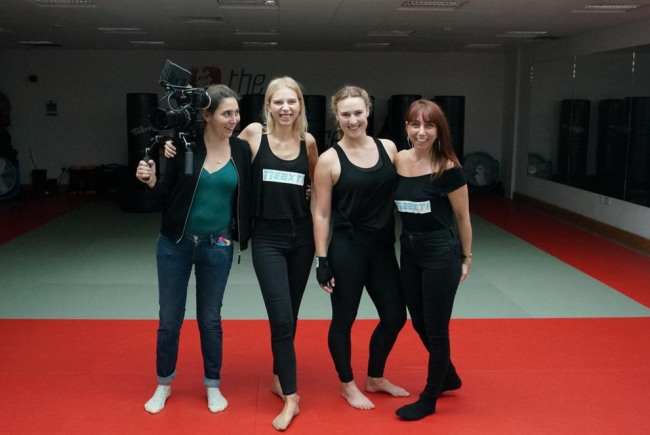 Finally Our all female crew will help make this a film like no other! We also have great prizes and rewards for pledges starting from £15: 1. £15 Private link to the film 2. £20 Handwritten drunken postcard (send us an email with your address to n.m-bluefilm@hotmail.com and you will receive this postcard) 3.£100 Neext! T-shirt 4.£200 Invite to an exclusive cast and crew screening followed by an after party 5.£500 Associate producer title But £2 pledges are also possible and very welcomed. Who needs Hollywood when we have Cricklewood! A great day of filming on a beautiful sunny day in Cricklewood Market. This picture was taken by the Barnet Film Office who are very supportive of our film Neext! It shows just what a wonderful and united crew we are. Did you know that the lead actor Cian Barry is Irish? 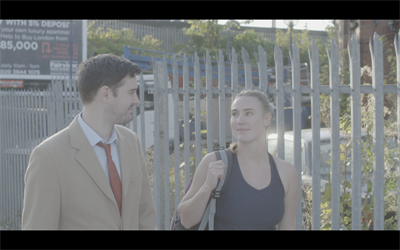 We're honouring the Irish background of Cricklewood and have a fun little winks to it in the script! Help us complete this film so you can see it! We started filming thanks to the support of 72 backers from our Indiegogo campaign: https://www.indiegogo.com/projects/neext#/ Unfortunately we are unable to finish the edit without funding from Barnet hence this campaign! Producer + Writer - Nicole Lieberman is an active longterm resident of Cricklewood. She has a Masters in human rights law. She is always looking at different ways of combining her two passions human rights and film. Nicole makes a point of involving the local community in most of her projects. Nicole is currently also working on a Ugandan/British feature film which was shot in a remote, rural location. This required the production team to engage positively with the local community, work with different organisations and focus on capacity building. Lead actress + writer: Liza van der Smissen is also a long-term Cricklewood resident. Liza came to London to study at the prestigious Bird College. After graduating she has worked on feature films filming internationally. She also featured in productions for The Royal Opera House, The Telegraph and performed in various London West-End theatres. Director: Leoni Tenius is a filmdirector. She studied at the Met Film School London where she graduated with First Honours in Practical Filmmaking. Leoni has won the Zoom Award for the Best International Film for her first short film Child of War, as well as the Imagining the Imaginarium Competition chaired by Andy Serkis and has directed and edited several live action and motion capture short films with Serkis’ The Imaginarium Studios. 1st Assistant Director: Franzisca Morai, also a Cricklewood resident. Has worked on various short films as a director and assistant director. 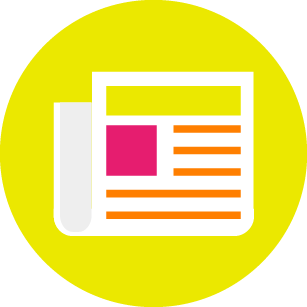 Project Delivery Manager: Nicole Lieberman The Project Delivery Manager takes legal responsibility for receiving and spending the funds raised and ensuring the project is delivered.